President Barack Obama will take up his role as comforter-in-chief once again — this time on home soil. The president plans to travel to Arkansas on Wednesday to view the devastation left by a string of tornadoes that ripped through a dozen towns last Sunday — just as Obama was travelling through Asia. "I'm pleased the president is headed to Arkansas and can see the devastation firsthand," Sen. Mark Pryor said Saturday in announcing Obama's trip. The president will tour Little Rock in response to a letter sent by Pryor. "The last few years have been particularly difficult for our state," the senator wrote. "We've faced dozens of damaging weather events, ranging from tornadoes to ice storms to drought." 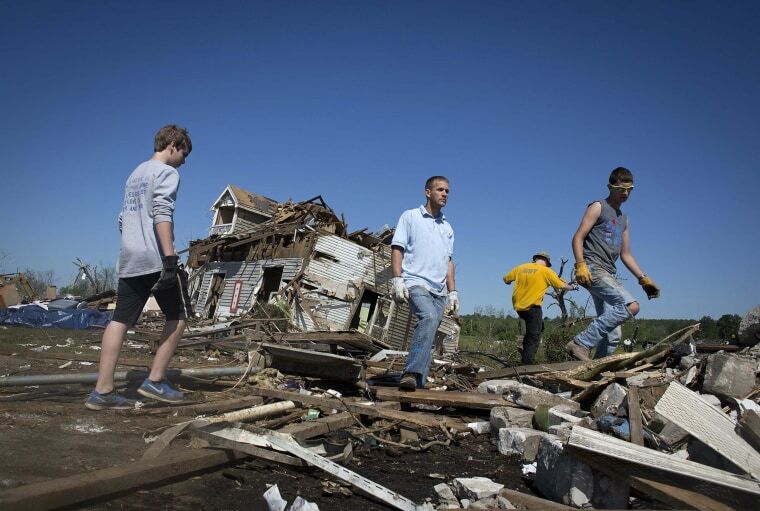 Vilonia, a tiny town about 35 miles north of Little Rock, was hit hard by a tornado almost exactly three years before Sunday's twisters flattened the city. Fifteen people were killed, more than 150 people were injured and 264 homes were damaged by the latest tornadoes in Arkansas alone, Pryor's letter said. Obama signed an Arkansas disaster declaration on Tuesday, less than 24 hours after Gov. Mike Beebe made his request to Federal Emergency Management Agency officials for aid. "Arkansans impacted by these terrible storms aren’t giving up," Pryor added. "That’s because Arkansans understand the importance of coming together and pitching in to get our state back on its feet."